Heat oven to 350F, 180C or gas Mark 4. Mix together the granulated sugar and teaspoon of orange zest in a small bowl to make the orange sugar, and set aside for later. Cream the butter until light and fluffy using a wooden spoon, then add the caster sugar and egg and beat well until fully combined. Then take a metal spoon, and fold in all of the remaining cookie ingredients until they have combined into a soft/firm dough. Shape the dough into small balls, about 1 inch diameter, and roll each ball in the orange sugar. Place onto an ungreased, but non-stick cookie sheet about 2 inches apart. Flatten each ball with the bottom of a glass (or your palm). Bake for 7 – 11 minutes, or until the edges of the cookies are lightly browned. Cool on the baking tray for a few minutes, then carefully remove from the baking tray using a spatula, and cool fully on a wire rack. These cookies keep well in an airtight tin for about a week (if they last that long! ), or they can be frozen before baking, defrosted and then baked if you want a smaller batch. You can also substitute the dried fruit and nuts for your favourite treats – try cherry, orange and almond, or date, lemon and walnut – delicious! This recipe was sourced from Sweet ReciPEAs at http://www.sweetrecipeas.com/2007/04/09/195 and was adapted from the original recipe from Land O’Lakes Holiday Cookies 2005. 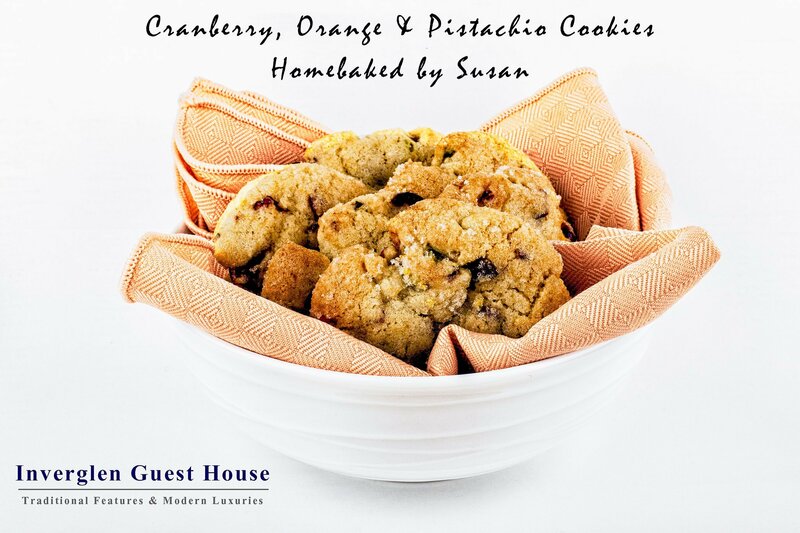 Susan makes all her biscuits and cakes by hand, so this recipe has been changed a little to reflect this, but if you have a food processor or mixer, you may be able to combine some of the steps.